Bakugan: Mechtanium Surge is the fourth season of the Bakugan series. It involves creatures called the Mechtogan, and they brawl using Mechtogan Activators. Another addition to this new season is the BakuNano, which is the replacement for the Battle Gear. The strength of the Bakugan Battle Brawlers team is shaken to the core with the threat of losing Dan's leadership! A new and insidious enemy infiltrates Bakugan Interspace shattering the loyalties of the brawlers and their ardent fans... Dan and the brawlers find themselves challenged for their title as the number one battlers. Strange, foreboding dreams haunt Dan and Drago. Their exposure to Code Eve and the Sacred Orb on Neathia has infused them with powers they are unable to control! A year has passed since the Bakugan Battle Brawlers defeated the Twelve Orders and Emperor Barodius. Peace has returned to Neathia and Gundalia. The "Grand Prix Bakugan Tournament" finds Dan and the Brawlers challenged for their title as the number one battlers! But all is not what it seems. Unknown to Dan and Drago, their exposure to Code Eve and the Sacred Orb in the final battle on Neathia has infused them with powers they are unable to control! This energy has unleashed a powerful force in the form of Mechtogan! Dan, Marucho and Shun must unite once again as they battle with their combined strengths to overcome a powerful enemy who is unleashing an army of dark Bakugan who threaten their Universe! It's been over a year since the Gundalian-Neathian war was resolved, and Dan Kuso, Marucho Marukura, and Shun Kazami continue their brawling adventures in Bakugan Interspace. Marucho no longer has full authority over Interspace as he relinquished its control over to the computer system. Interspace has also been upgraded, with more battlefields and optimal views of the different arenas. There is also a Grand PRIX tournament going on, with brawlers forming teams as they brawl for the top ranks. Dan, Marucho, and Shun have teamed up, although it seems as if Dan usually brawls alone while Marucho and Shun wait until help is needed. 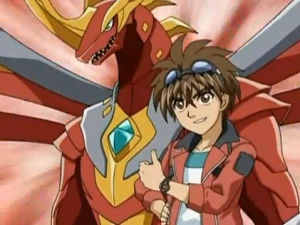 Marucho and Shun now have new partner Bakugan. 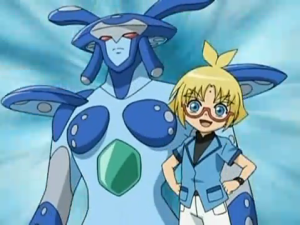 Aquos Tristar is a Bakugan from Gundalia, and can be funny and mean and talkative. Ventus Taylean is from Neathia, and is the calm one of the two. Having Gundalian and Neathian Bakugan by their side implies the growing friendly relations of Gundalia, Neathia, and the brawlers. However, no story has yet been told as to how Tristar and Taylean became Marucho's and Shun's partner Bakugan. Rafe: Rafe is a Neathian Castle Knight that was sent to Earth and Bakugan Interspace by Princess Fabia to train under the brawlers. He is a fan of the brawlers, starting from back when they helped save Neathia from Emperor Barodius' invasion. He is saddened when he saw that the brawlers have become a wreck when he and Paige arrives at Interspace. Paige: Paige is a Gundalian soldier, also sent to Earth and Interspace with Rafe by Princess Fabia. They were tasked to tell the brawlers about the Mechtogan, and also to be trained by them. Unfortunately when they see that the brawlers are on their breaking point, she is not impressed and looks down on them. Paige is muscular and tomboyish in appearance, and also has a tougher personality than Rafe. Spectra Phantom: Spectra comes to Interspace as a Darkus brawler. Mag Mel: Imprisoned with Razenoid in an unknown dimension, Mag Mel is the main villain of the season. He is shown to have gold armor all over, and it is not yet known what kind of entity or being he is. To escape from the bonds that tie him to imprisonment, he needs Drago to release more power. The connection between him, Razenoid and Drago's power is still unknown at this time. Chaos Bakugan: These Bakugan serve under Mag Mel, apparently brainless and controlled by him, and are played by brainwashed brawlers to achieve Mag Mel's objectives of acquiring more power. Anubias: He is the charismatic leader of Team Anubias, one of the top teams in Bakugan Interspace and a challenger of Dan's team. Anubias was ranked second in the Interspace rankings. But after Dan and Drago's uncontrollable power-ups and defeats, he was able to overtake Dan and get the no. 1 spot. 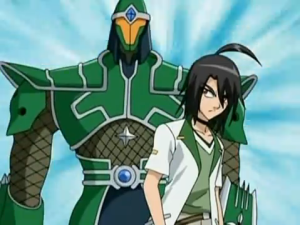 He has used other Bakugan in battle, like Pyrus Bolcanon, but Anubias is mainly a Darkus brawler. Ben: Ben is the biggest and rowdiest of the members of Team Anubias. He seems to be Anubias' right hand, although it is not known if the members know that Anubias serves Mag Mel. Ben shows great loyalty to Anubias. He mainly uses Darkus Horridian in his battles, but also uses Pyrus Bolcanon from time to time. Jack Punt: Jack is the smallest in the group and is very childish. He seems to be the Aquos brawler of the team, as he has never brawled with anything but Aquos Krakenoid. Robin: Robin is the quiet one on Team Anubias. Much like Shun, he has strength and stamina in battle and rarely let's his emotions override his actions. Sellon: She is the 3rd ranked brawler in Bakugan Interspace, and is the leader of the 3-girl Team Sellon. Despite only having 2 followers on the team, Sellon is acquiring more and more fans and is meticulous in gaining fame. She is mainly a Ventus brawler, but is shown to be also using Bakugan of other Attributes. She is also shown to be extremely loyal to Mag Mel, and very cunning in her plans. She managed to manipulate Shun and seems to be superior to Anubias. Chris: Chris is the youngest of the two members in Sellon's team. She and Soon are competitive with each other in getting Sellon's approval, and constantly tries to imitate their leader in battling with grace. Chris is known to have an inner anger when battling. Soon: Soon is the more mature of the two members, but she also shows the same competitiveness with Chris in getting Sellon's attention and approval. Much like the third season, and also not much like it, the new season gives out a new look in their packaging. The design somehow reverted back to the blue color scheme of the first and second seasons. This may be because we might be seeing the Bakugan from the second season (evolved perhaps), like Ingram, Elfin, and Helios. This is still only speculation, however, especially if they will appear in the anime or not. To take a look at the new Bakugan packs of the new season, go to the Mechtanium Surge packs here. The fourth season introduces a new set of characters into the world of Bakugan. Mechtogan are beings that are a product of Drago's invested powers brought by his exposure to Code Eve back at Neathia. They are an evil entity that becomes more powerful as Drago unleashes more power in brawling. Aside from the Mechtogan, there are also what are called the Mechtogan Titans, which are larger versions of the Mechtogan. The Mechtogan will be unleashed into form in Bakugan Interspace by Drago. It seems like this event was due to Drago's exposure to Code Eve. Dan also has the same nightmares or visions about the Mechtogan as Drago has, although for now both still do not have any idea about the Mechtogan. As for the Mechtogan Titans, there is still no word as to how they will fit in the animated Bakugan Tv series storyline, or if they will really be shown at all. It could be that all they are are the big versions of the Mechtogan, like the Bakugan Deka and the BakuMorph are to the Bakugan. The BakuNano are a new addition to the Bakugan line, but their purpose is not all that new. They are for season 4 what the Bakugan Battle Gear was for season 3. Like the battle gear, the BakuNano is a kind of weaponry that the Bakugan or Mechtogan can use to add to their G-power level. And, also like the battle gear, the BakuNano only has three attributes --- Gold, Silver, and Copper. Purchase Mechtanium Surge Bakugan Below.